This is a comprehensive unit that explicitly teaches students how to expand their sentences and elaborate on their utterances. Elaboration practice is important for both spoken and written language. It includes 80 slides for a very thorough introduction to sentences vs. non-sentences and progresses towards teaching students to formulate more complex expressions. It provides five guiding questions to aid in increasing the length of both verbal and written expression. This unit displays nicely on interactive whiteboards during whole group instruction, on a tablet for small group lessons, and speech teletherapy platforms. This is a full-color unit and is intended for digital use however if you prefer there are visuals that could be printed for collaborative use during literacy centers. 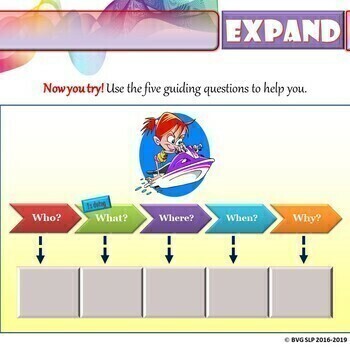 Several of the slides are great visual aids and can be printed, laminated, and distributed to your students for assistance with remembering the five guiding questions. I have provided a variety of options for the visual cue slides so that you and your students can determine which is most effective for them. 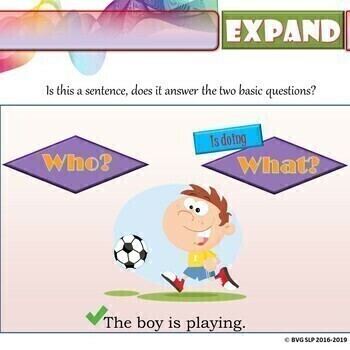 Allow students to interact with the material by giving them the opportunity to approach the board and fill in the blanks or work in small groups and turn it into a game, assign a "wh" question to each student and let them offer a response to collaboratively create fun complex sentences. Be creative and do what works best for you and your students. If you like this unit you may also like my "Can you DESCRIBE that?" lesson. It is a nice progression towards teaching students to incorporate detailed descriptions into their conversations and writing. Thank you for shopping with me and please check back often for new products, sales and promotions!